Keen is a progressive company that creates premium footwear, bags and socks. 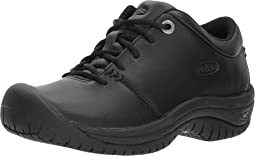 Keen’s passion runs deep from their roots as an outdoor footwear company to this new line of workplace footwear designed to protect you in comfort and style. 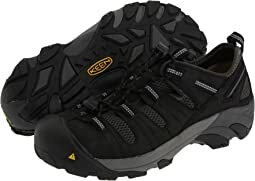 Keen’s signature style and comfort meets steel toes, waterproof leather, reflective piping and slip-resistant soles. 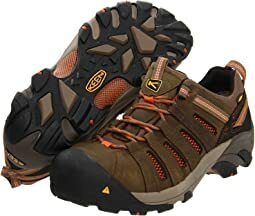 Keen Utility shoes and boots are tough as nails. 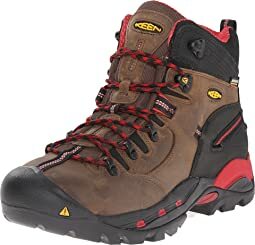 Keen Utility boots and shoes are equipped to get the job done right with all ten toes intact. Uncomfortable in the toe box. I'm returning. One shoe was wrinkled compared to another. Otherwise the fit and comfort is good. Let me start off by saying that I own over 10 pairs of Keen shoes and most of them have been great. I love them most because of their comfort and width. I had to return these because they were too stiff. 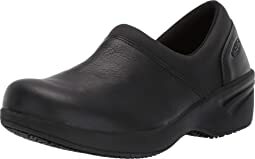 Before I bought these, I read through all of the available online reviews from many websites and most of the buyers liked them and said they could stand for hours/the whole workday without tired feet. But when I tried these on, I found the soles to be unyielding and unforgiving and the whole shoe stiff and heavy. The sides also rubbed against the side of my big toe. 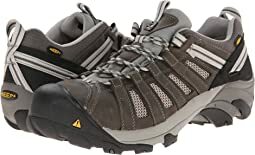 They're quite unlike most of the Keen shoes I've had that felt good the moment I got them on. 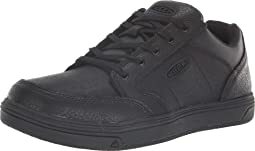 I purchased these shoes for work, as I stand on my feet for long hours. Not only are they super comfortable but my back and feet have no pain. They are cute enough but not so feminine for everyday wear. GREAT SHOE! EXACTLY WHAT I WAS LOOKING FOR. SAFETY AND COMFORT. I HAVE 14 WIDE FEET AND THESE FIT GREAT. I WOULD RECOMMEND GIVING THESE A TRY. All keens run large so I expected that. What I am surprised by is the lack of quality. I was getting a hole in one shoe within a couple of weeks. I only have only used them about 4 months and they look awful. These are not meant to actually be worked in. you would never know these stylish boots are serious workboots. They weigh a LOT, very sturdy construction, and steel toes that mean business. I feel very confident these boots are going to last a good while. I wish the toe box was a little wider, to accommodate thicker socks, but I think they'll wear in OK. They cost $50 more than my second choice, but I think they were worth it. I have had my Keen utility for almost a year and they have held well. 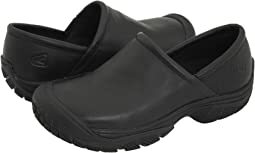 I bought these shoes 3 and a half years ago to wear in the operating room, sometimes standing in one place for several hours, also walking around the hospital daily for rounds. After 2 and a half years, I left my busy hospital position to volunteer for a year in a West African mission hospital. These shoes have been through it, and stood up to the challenge. The tread is still as non-slip as the day I purchased them. The leather upper repels blood and other body-fluids like they were designed to be warn by medical professionals. 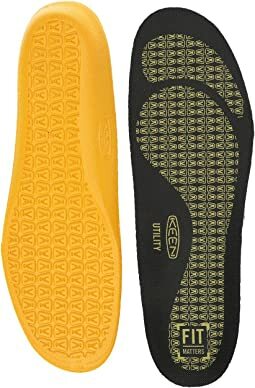 Right before I left for Africa, I bought the replacement insole, not because I needed it, but because I wanted to have them in case I needed them. I ended up putting them in the shoes about 3 months after i got here, and they were even more comfortable than the originals! So now, 3.5 later, the shoes still look fine, which is amazing after all the abuse I put them through. They still fit well, even after a full day on my feet when they are usually swollen and painful, they are still as comfortable as when I put them on. That isn't to say that they have the softest insoles I've ever tried. 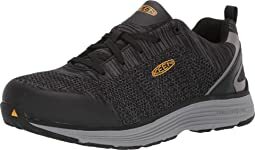 They could use a little more cushion, which is why Keen sells an additional insole for less than $15, but I lasted for 2 and a half years without additional cushion and never complained, so there is enough. 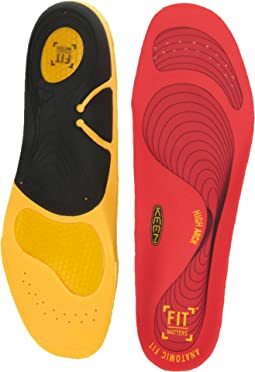 If, however, you need more arch support, think about getting an insole that will provide that, there is very little arch support to speak of in these. 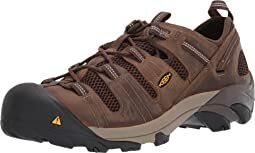 If you have wide, trail beaten feet like mine, need to be on your feet all day, and need something that will last, these are 100% worth the cost. They are good but then again they are 50.00 I would like a higher arch but I guess they will work. I go up and down stairs a lot like 14 stories worth and the rest is concrete and gravel. Its probably the harshest environment your feet could have. That's why spending the extra money on an arch support is warranted. 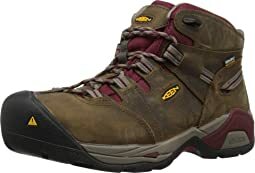 Keen makes great boots I have tried many of there styles. 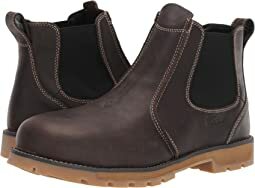 I wish they made some pull on type Wellington boots with the work shoe bottom. They do make some pull on type work boots but the soles are different all said and done Keen makes great work boots. Boot runs true to size and width. I find most medium width boots to be too tight but these are comfortable. 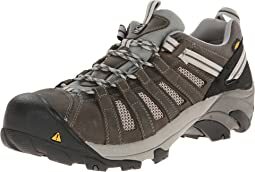 I am hoping they hold up as well as my other Keen shoes. Bought these for my husband as a walking shoe. They are very neutral, and so they go with everything. We bought a few to compare, and my daughters thought these were the most fashionable. He will use them to walk the dog and walk about town. 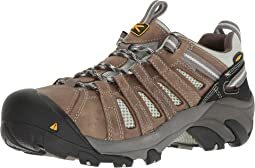 They would make a nice light hiking shoe. Very puddle-friendly. 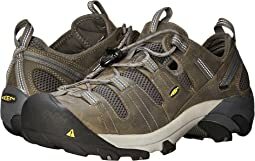 I have enjoyed Keen shoes for many years. I bought these for a job I start next week. I will be working 12 hour days on concrete. I have worn them this week for 3 hours at a time standing on a rubber mat at my current job. My feet ache and my knees are hurting. I didn't have any problems before I wore these shoes. I will not have a rubber mat at my new job, but will be doing a lot of walking on concrete. Certainly a well-made shoe that I know would have got the job done. They were just too small. 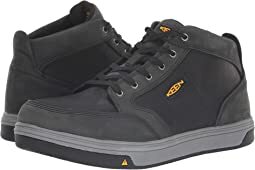 I normally wear an 11.5 W or a 12 reg, and I purchased these in 11.5 W. They fit okay, but the steel toe box was pressing right up against the widest part of my foot on the inside. One size bigger and my toes would almost not be covered by the steel, so these just didn’t work for my particular foot. Return in progress. I had high hopes for these beauties as they are lightweight for a safety shoe. I ordered 8.5 and 9 just because I never know how the sizing runs. I put the 8.5 on and immediately took them off because I could feel the toe cap on top of my feet. Not cool. So I tried the 9, and it was a little better, I could still feel the toe cap =( and the shoe was just a little too big for me. 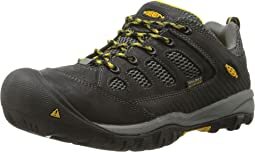 For the time being I will go back to wearing my other Keen safety shoes (Flint Low) til I find something else. For me it wasn’t very comfortable. It’s a good quality shoe but I didn’t have any arch support. It was a bit stiff across the top of, where the toes bend, just below the laces & eyelets. When I took a step, as my toes bend, the leather crease would form two points and poke into my foot. It was some what annoying. Maybe it would have went away once the shoe was broken in but I didn’t want to take the chance for 120 bucks. Returned. One more point I’d like to add, the bottom out soul of the shoe was completely flat. Had good slip resistance., but I did not find it very comfortable for me. If you are a person who is comfortable wearing Converse or Vans branded shoes then this may be a good choice for you. Thanks. I am 58 y/o chef. My feet have walked many miles. These clogs, so far, are the most comfortable I have ever worn. I hope they hold up! I’ve had bunion surgery on one foot 3 yrs ago. These feel great! I do have limited styles I can wear and these are cute and comfy! 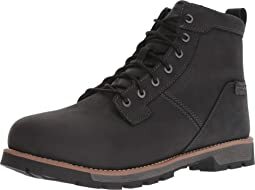 Bought these for my fiance for his office job that sometimes requires him to go out into the field. He says they are comfortable and durable. However, laces frayed within a few months of owning them and the insoles are quickly wearing out at 6 months of daily wear. The front part of his left shoe is also detaching from the sole, but not enough to be unwearable. Could be better made for the price, but good if you wear occasionally as not to wear down the laces/insoles. Great looking. Comfortable. I believe it will hold up to USPS congested docks. This was my first pair of this style and I love them!! .I needed new steel toe boots for work. My five year old Timberland Pros were falling apart. 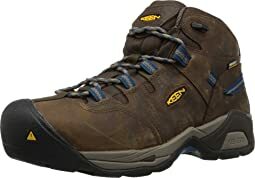 I was looking for something lighter and have heard good things about Keen. I ordered these in 10D (my normal size) and they fit great right out of the box. They are heavier than expected but certainly much lighter than the Timberlands. They seem well made and don't have the "clown shoe" look that some other Keen models have. One minor complaint: I needed to print a receipt so I could get reimbursement from my employer. When I tried to print a receipt it was always missing a piece of information I needed. I had to call customer service and have them email a complete usable receipt to me. Otherwise, great shoe buying experience. This is my second pair. I hike almost everyday on all terrains and when it is wet. They lasted 21 months before the soles wore out. I had to have a half size larger this time, could be due to foot growth (feet do continue to grow). I rather they had replaceable soles. I like the feel, the way they cinch up instead of tying. Good traction too.